Discussion in 'SHH Community Forum' started by Lurk, Apr 14, 2006. Wow, the right one has white ****! Were you raped by this guy? Can this be Human-Faced-Satan-Cat's girlfriend? it looks like he's got a tumor in his right leg. That's one of his victims. 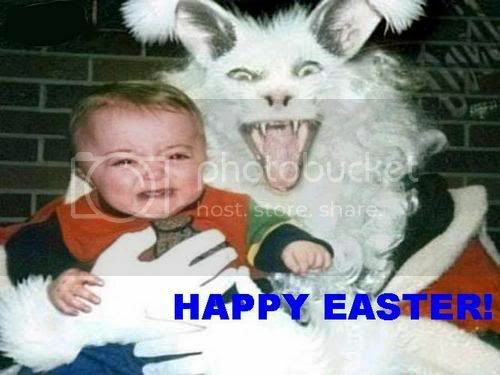 Have you guys ever seen that America's Funniest Home Video of the little kid afraid of his dad dressed up in a Easter Bunny? He's just happy to see you. Easter's not till tomorrow but ya know. ^Yeah, I was thinkin that myself. Guess everyone's just starting early. Some people actually celebrate Easter on Saturday.Its called Easter Saturday,some celebrate Easter Sunday.